Jack LaLanne 1914-2011, the founder of the modern fitness movement and the first video workout star dies at the age of 96. While I wouldn’t say he was a friend, I was privileged to work with him a couple times. In my past life as a Director of Photography, I was working my way up the ladder in New York City as an assistant cameraman, back in the good old days of film. The first time I worked with Jack was on a commercial for one of his New York clubs. During the lighting preps, we all thoughts we’d try the machines, and naturally we started to compete with each other. The next morning we all limped and groaned our way back into the club for the shoot, which seemed to take forever. I hurt in places I didn’t even know that I had! A few years later, I was working on an ABC 20/20 piece in Miami about Jack. The crew went out partying at night, and we decided to take a nice long walk on the beach. I was the only one who went swimming through the surf and swam parallel to the beach for quite some time. While I could see everyone, no one could see me. After awhile, some of the women in our crew thought I must have drowned, and were actually crying when I crawled back to shore. Not the smartest thing I’ve ever done. (For you youngsters in the crowd, back in the 1920’s, Weissmuller was one of the world’s best swimmers, winning five Olympic gold medals. He was perhaps best known for his role portraying Tarzan in films, a role he played in 12 motion pictures.) Jack meant the comment as a compliment and, unlike everyone else in the crew, didn’t criticize me for swimming alone in the ocean at night -even though I deserved it. 1954 (age 40): Swam the entire length of the Golden Gate Bridge in San Francisco, underwater, with 140 pounds of equipment. A world record. 1957 (age 43): Swam the Golden Gate channel while towing a 2,500 lb. cabin cruiser. The swift ocean currents turned this one-mile swim into a swimming distance of 6.5 miles. 1974 (age 60): For the second time, he swam from Alcatraz Island to Fisherman’s Wharf. Again, he was handcuffed, but this time he was also shackled and towed a 1,000 lb. boat. 1976 (age 62): To commemorate the “Spirit of ’76”, U.S. Bicentennial, he swam a mile in Long Beach Harbor. He was handcuffed and shackled, and he towed 13 boats (representing the 13 original colonies) containing 76 people. He was still exercising two hours a every day including when he was in his 90’s. LaLanne also gained recognition for his success as a bodybuilder as well as for his prodigious feats of strength. Arnold Schwarzenegger once stated, “That Jack LaLanne’s an animal!” after LaLanne, at 54, beat a 21-year-old Schwarzenegger “badly” in an informal contest. LaLanne invented a number of exercise machines, including leg-extension and pulley devices. Besides producing his own series of videos, he invited women to join his health clubs and told seniors that they should exercise despite their limitations. Here’s a video of Jack at the age of 94. The clip was a perfect coda, too. 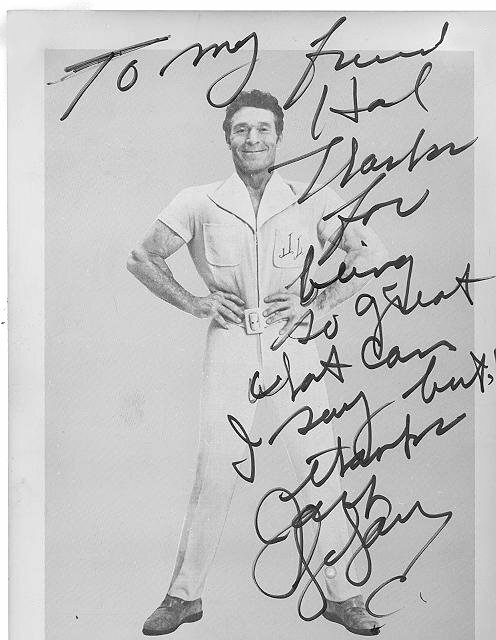 What a manly man, Jack LaLanne! I used to see him on tv back in the 1950’s and wish now that I’d have joined in, instead of simply scoffing at a jumpsuited man exercising to the beat of an off-camera Hammond organ. He was truly an Original and it’s great you got a chance to work with him a couple times Hal… in between your swimming marathons!